I love July. All of my favorite activities are available in July. It usually takes until now for me to want to get into the water. I am famous as a temperature wimp. If you need a wet suit to be comfortable in the water, it is too cold for me. So by now there are a multitude of activities calling me into the H2O. Spear fishing over the shallow patch reefs for mangrove snapper is a favorite hobby of mine, and it lets me scout patches for hook and line fishing sites for when I have anglers who want to get in on the snapper spawn from topside. It also gets me ready for the recreational lobster season coming the last Wednesday and Thursday of the month. Yes, my fishing ADD is in full swing. However, putting the hobby part of the month aside, it is the hook and line fishing for the mangrove snapper that really puts a smile on my face. This is an activity custom made for the whole family. Young and old alike can get in on the action and have a great time acquiring one of the finest tasting treats that the Keys have to offer. The rules are very different depending upon whether or not you are fishing in State or Federal Waters. The Fed has a more liberal bag limit of ten fish, as opposed to the State’s five fish. However, the twelve inch size limit in Federal Waters is slightly more restrictive than the State’s ten inches. 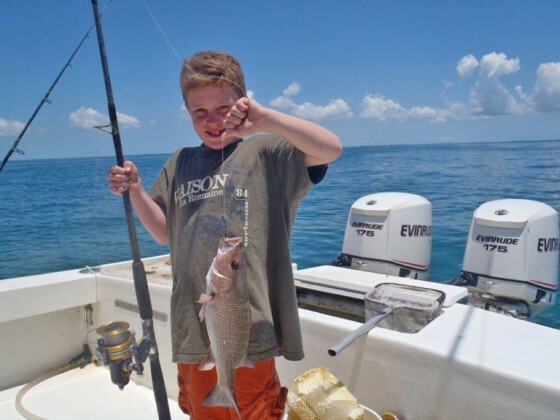 The size limit should not be much of a concern because it is relatively easy to get a limit of fish that are closer to twenty inches than the ten or twelve that the minimums require. The most important factor in singling out the larger fish is bait selection. Within reason, the bigger the bait the bigger the fish. 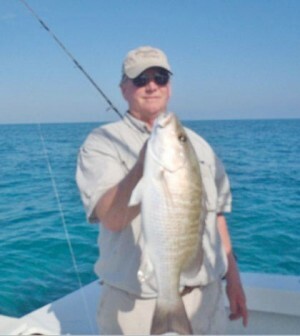 Instead of using shrimp, which is without a doubt the most popular bait in the Keys, I prefer to use live pinfish. The shrimp are actually a little too effective. They are gobbled up by everything that swims. This means that you will go through a bucket full, often with little to show for your effort besides a wide selection of smallish stuff. The fifty cent piece size pin fish are often referred to as snapper candy, and for a good reason. The larger fish will gobble them up whereas the smaller fish will tend to let them be. Another outstanding bait for snapper is cut ballyhoo. Again, larger pieces of bait are the key. I do not try to get more than two plugs from a medium sized fish. To prepare a ballyhoo, simply remove the head and tail of the fish and then cut it in half. I use a larger hook than some. I like the 4/O short shank bronze bait hook from Mustad (the 9174). This way there is plenty of hook to transect the bait with and enough point and barb exposed to find its way into the snapper on the hook set. If you use too small of a hook it often does not make its way out of the bait far enough to set firmly into the snapper’s mouth. I tend to keep my rigging simple. I use a knocker rig for my snapper fishing. I find a three quarter ounce egg sinker is sufficient to get your bait to the bottom on the patch reefs that I prefer to fish. I also use thirty pound monofilament line for the main line from the reel. That way my main line can double as my leader, and it also gives me the strength necessary to horse fish away from the abundant structure that the snapper prefer. If you fish for any extended period of time and you do not occasionally get hung up in the reef, you are fishing too far from the structure. Chum is the key to getting the snapper in to a feeding mood. You want to flavor the water, but not put so much food into the water that they fill up on the freebees. I like to use a chum cage instead of a chum bag. The chum cage allows me to regulate my chum flow with more control than does the chum bag. You leave the majority of the chum box on the chum and regulate the rate of flow by how much of the lid you tear off of the chum box. Another benefit of the chum cage is the ease of clean up at the end of the day. If after between fifteen minutes and a half hour there is not a school of snapper in your chum line, you should pick up and find another spot. The fish that you see coming to the surface during the day will probably be the small and medium sized fish. The larger fish are more wary and will have taken up position farther back in the chum line near the bottom. Tossing your bait past the hoard of smaller fish will produce the larger more coveted fish.